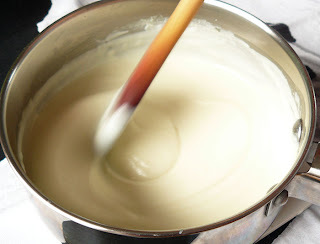 As a mother sauce, Béchamel sauce is used in so many dishes, either on its own or combined with other sauces. It is hard to imagine Lasagna, Cannelloni or Manicotti without this creamy sauce. Just add some grated Gruyere or other melting cheese and you have a Mornay sauce. Meanwhile, heat the milk in a separate pan until just about to boil. Add the hot milk to the butter mixture 1 cup at a time, whisking continuously until very smooth. Bring to a boil. Cook 10 minutes, stirring constantly, then remove from heat. Season with salt and nutmeg, and set aside until ready to use. This sauce freezes well.